This being fall and being in the mist of the Great Pumpkin Shortage of 2009, I had to grab as much canned pumpkin as I could to be prepared of anything to come my way. What’s a person to do with like 8 cans of pumpkin, and quite a few of squash bought in a fit of hysteria? 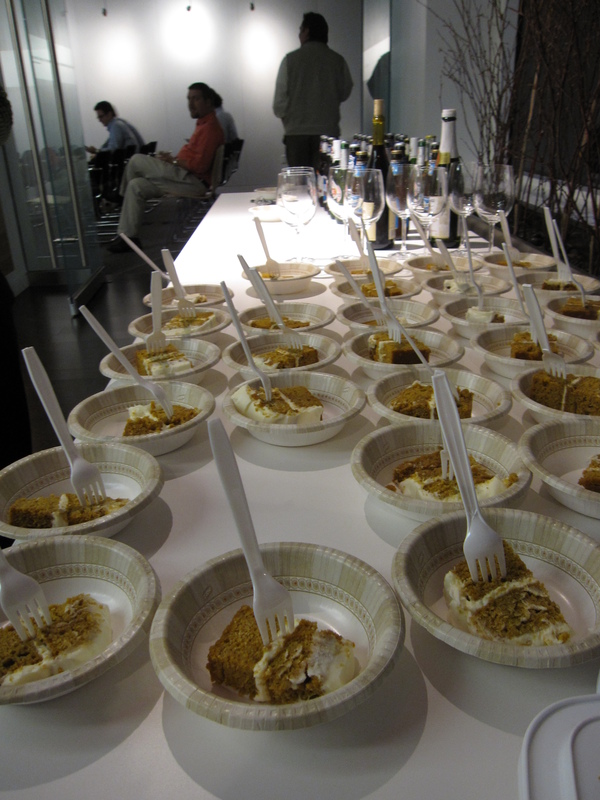 Make Pumpkin Cake, of course! All of this worked out perfectly for the monthly cakes I make for our staff meetings to celebrate the birthdays. Unfortunately, I had to combine Oct and Nov since I was too busy with hw the night before the Oct staff meeting. I found a recipe online but it called for an insane amount of eggs and oil so I figured I could find something a bit less artery clogging and keep searching. 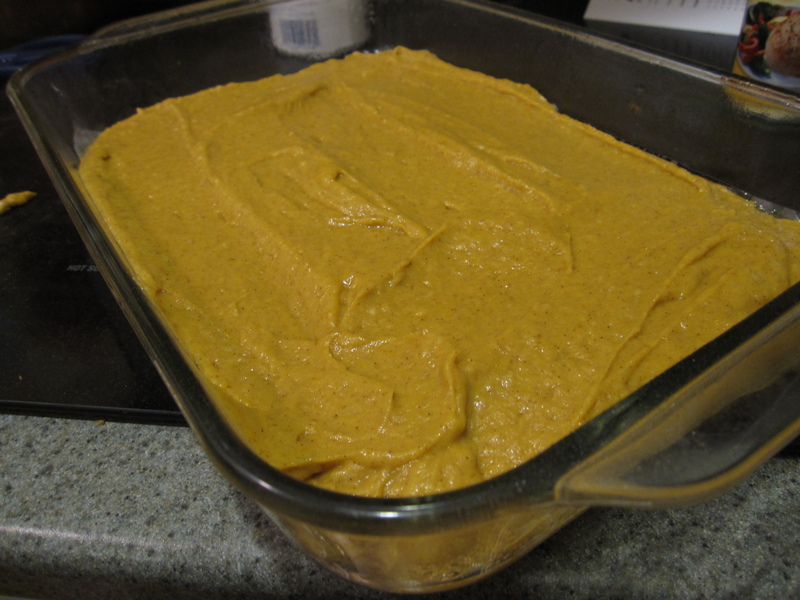 I went for my Fearless Baking cookbook by Elinor Klivans and found a recipe called Pumpkin Cake with Brown Sugar Icing. This recipe seemed normal with 2 eggs so I decided to move on from there. I would have made the recipe as is except I did not have whipping cream for the icing since I had anticipated a cream cheese frosting from the start. I think I’ll give this another go and make it with the brown sugar icing since the cake came out so well with a light texture, perfect flavor, and a nice hint of ginger. Yes, this is true. I don’t really eat the cakes I make. I’m a savory person who would rather eat chips/pretzels/tortilla chips than cake/cookie/ice cream/fudge/etc. I can’t buy goldfish crackers or cheez its… cheese and salt, damn you being my two favorite things! Honest I tried a piece of the cake that I trimmed off to sqaure them off that square inch was enough for me. I made 3 batches of this cake that I divided among 2 pans. I had two 9×11 pans but 1 was ‘borrowed’, so I used the 9×11 and a 11×13 that I have. I just had to keep an eye on the baking times. Instead of using 1 cup canned pumpkin I just used the whole can. This might have prevented the cake from rising as much but it resulted in a very flavorful and moist cake. Preheat oven to 325 F. Line pan bottoms with parchment paper, and butter or oil the sides and bottom. Sift together the dry ingredients (except sugar), set aside. Combine the canned pumpkin, sugar and oil in a large bowl and beat with an electric mixer/stand mixer until smooth, about 1 minute. Add the eggs one at a time, beating until well incorporated. Once the mixture looks smooth and shiny begin to add the dry ingredients in batches. Pour batter into pan, layer pecan halves into batter. Bake for 30 minutes, or until a toothpick is inserted in the center is clean when removed. Let cake cool in the pan for 10 minutes before removing to continue cooling. 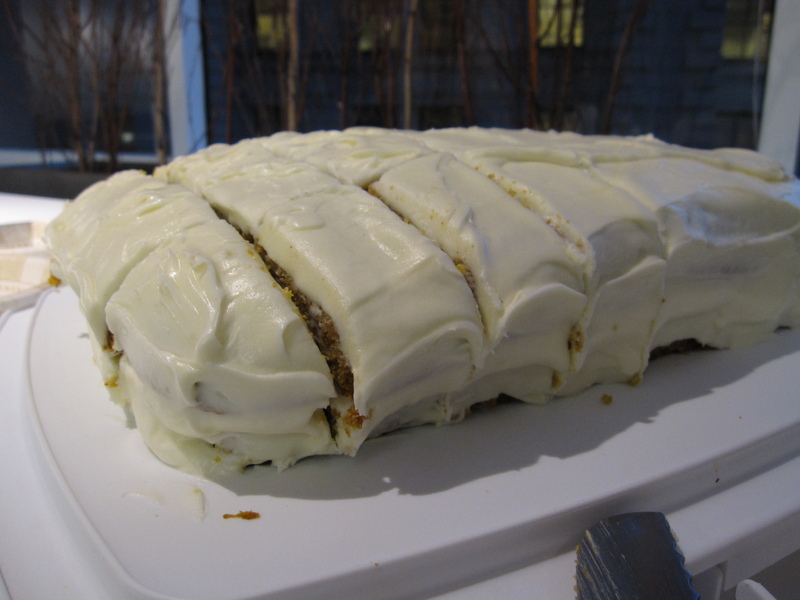 The frosting is made by creaming the butter and cream cheese together with an electric/stand mixture. Sift the powdered sugar and slowly combine into the butter mixture. Lastly add the vanilla and beat until smooth. Apply the frosting once the cake has completely cooled. When transporting layer cakes place dowels or toothpicks into the cake to prevent the layers from sliding apart. Hey! Thanks for the clarification on the fuji instamax cameras. I definitly want the smaller version and I love the smaller pictures they produce. I want to be able to put it in my purse!! Your cake looks so yummy! !